Road safety is important. There is a need to make street life safer and feel safer. If our streets are more appealing places to be more people will use them as pedestrians and cyclists, encouraging a greener and healthier lifestyle. Making progress on this is a passion for the Highgate Neighbourhood Forum. We have several traffic problems in Highgate and they might seem contradictory. We have plenty of commuters passing through, high pollution, dangerous manoeuvres, double parking, dangerous corners and crossings. The real paradox is that we have too many queues but also speeding when the queues are not there. Throw in a lot of children coming to the many schools (possibly 10,000 pupil movement each school day) and parks, and elderly trying to get around, and the mix is potent. Some of this is measurable and some is more anecdotal. The statistics show that there are many accidents on the streets nationally (1,700 killed and 22,000 seriously injured in 2014). Highgate has its problems too. 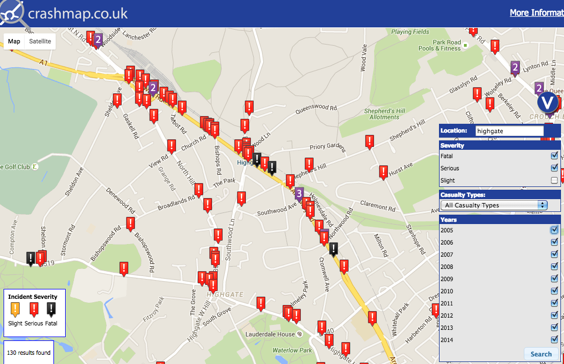 The map below shows that virtually all the incidents occur on the main roads, Archway Road or Highgate Hill through to North Hill. Even if the chances of an incident on any one walk or cycle are minuscule, accidents do happen. And while the perception of risk remains, fewer will shift away from car to foot or bike. We want to do something about it. The evidence about speeding is pretty clear too. The complicated thing about Highgate’s traffic is that for most people and much of the day the traffic is crawling. “What speeding?” people will wryly ask when you say there’s a speeding problem. Here we have some data from the boroughs. Camden does surveys on Swains Lane, Highgate West Hill and Highgate Hill and Haringey does so on North Hill. The excerpt below is from one day in March 2015 on Highgate Hill between (see the second column) 05.45 and 17.45. 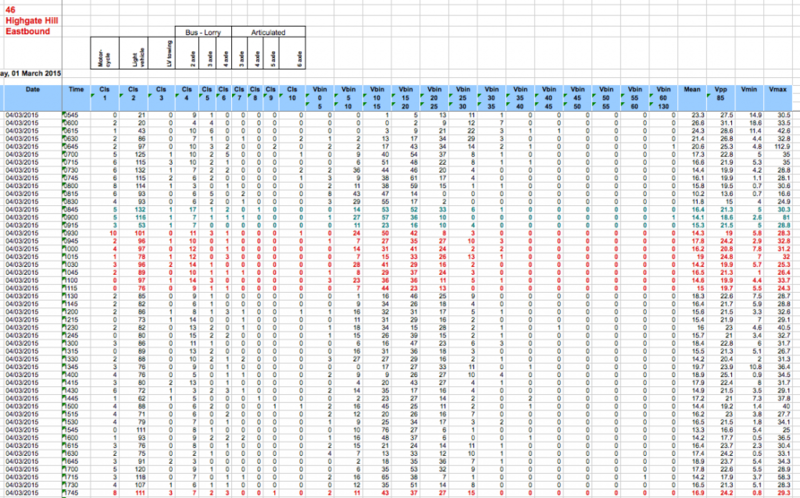 You can see (three columns at the middle of the table) that virtually all traffic passes at between 10 and 25mph. That fits with perceptions. Before the rush hour there are rather more vehicles moving at between 25 and 35mph as the lower traffic volumes allows that. The “mean” column, four from the end, is interesting. It records speeds around 25mph early in the day dropping to a low of 10mph at 08.15 before spending most of the day in the high teens. All looks reasonably safe and pretty much as expected. But the real danger of very bad outcomes from road traffic accidents is not at those speeds. The final column in the excerpt shows the maximum speed recorded in that period. It shows three extreme speed events: 113, 81 and 58mph. These are very high as anyone who knows the road could testify. They are only three out of perhaps 8000 vehicles on a typical day. The two fastest are almost certainly motorbikes. The best measure of potential danger is perhaps the “Vpp85” column, three from the end. This shows the speed that 15% of vehicles exceed. The table below shows that it rises from about 20mph in the early evening (and where it has been most of the day) to nearly 30mph by the time the pubs and restaurants are closing. That’s one danger time. A typical day might see 500 to 1000 vehicles moving along that stretch of road at a speed over 30mph. They are the ones – one in three passing vehicles in the evenings – that need to be slowed. The solution is not simple or easy. We have imperfect figures on accidents and safety from the police, fuzzy thinking from campaigners and policy makers, and divided responsibility between authorities for roads. On top of that we have a range of shouty vested interests from “Ban the car” through to petrol heads, and so the path to safer roads can seem well hidden. Introducing a 20mph speed limit is the latest fashion. Camden has had one since the end of 2013 following Islington (which claimed to be the first 20mph borough earlier in that year), and Haringey introduced it (for residential roads at least) at the start of March 2016. 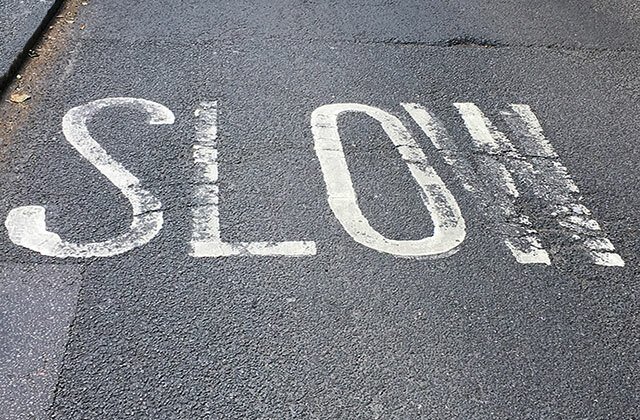 It sounds sensible – lower speeds must mean fewer accidents and especially fewer serious accidents. But does it make sense to have it on every street at all times? Streets come in all shapes and sizes and what might suit a small lane outside a school is not necessarily right for a three lane urban motorway like the North Circular. Beyond the principle, there are additional problems especially if a local authority is driven by evidence and wants to introduce a 20mph limit on the roads where the accidents mostly occur. In London, local authorities only have control over the more minor roads – main roads, mostly those with buses on them, are the responsibility of Transport for London. TfL’s main priority is for the fast movement of buses to cut travel times. This has resulted in the creation of urban motorways and fast moving bus lanes (for example Archway Road) which are not consistent with slower traffic speeds and safer roads. TfL red routes are virtually all still 30mph yet it is on main roads where most accidents occur. Speed limits are most effective when they are enforced by the police. Generally they have not been over active in doing so with the 20 mph limits, believing that their time is more urgently required on other activities. It was reported that no fines were issued in the first six months of the operation of the scheme in Islington. The Haringey policy is particularly unambitious. It only applies to side roads and measured speeds on side roads were virtually all below (or well below) 20mph, despite the 30mph limit, so introducing the lower limit is nearly a pointless exercise. It is great for sign manufacturers, councils that want to look busy and campaigners, but if traffic is already at low speeds, lower limits with new signs will have little impact on road safety. The early boroughs introduced the limits some time ago, so data is now beginning to surface that lets us see the effectiveness of the policy. This has been requested via Freedom of Information (FoI). Good news – at 39 locations the average speed had dropped by more than 2mph compared to the year before. Bad news – at 24 locations speeds had increased by more than 2mph. At only 31 of the 158 sites was the average speed below 20mph. Only at 2 sites was the 85th percentile speed (the speed at which 85% of vehicles go below) under 20mph. Indeed at 38 sites (one quarter) 85th percentile speeds are 30mph+. So, many vehicles are breaking the speed limit and little has changed since the lower limit came in. It takes time to change behaviour, fans of the 20 mph zones say. Perhaps. More enforcement might be the answer but it would be unrealistic to expect it in the current environment. If we want to change behaviours we need buy-in from road users and that probably means two things. First, we need to have sensible policies. This probably means a “horses for courses” approach adopting different solutions in different areas. There are roads where 30mph or even 40mph is fine – stretches of Aylmer Road or Archway Road, at night, when there are few if any other vehicles or pedestrians on the road. Similarly, there are stretches of road – outside schools on North Road and North Hill, perhaps – when even 20mph is probably too fast at a time when hundreds of children are spilling out on their way home. People generally respond more favourably to policies that make sense. Second, we need what might be called engineering solutions. The Forum will be consulting over road safety ideas, including engineering solutions such as cobbled roads, altered junction layouts, chevron parking, new signs and shared space, to try to get the balance right for Highgate. This is why we support the calming and greening plans from TfL for North Road. We believe that they will have the greatest effect on safety and speeds – and can also make Highgate look nicer. In the forum area we have two primary schools and Channing and Highgate School with total pupil numbers of about 3,500. They come and go each day. In addition, there are movements between sites and children returning home to the area from other schools or passing through. This adds to at least 10,000 movements. I’m no fan of Haringey Council, but I think you’re being a bit harsh on them calling their 20mph policy “pointless”. It certainly doesn’t only apply to side roads. A very few major roads remain at 30mph (as you say, “streets come in all shapes and sizes”) but all the rest, including North Hill, Muswell Hill Road, Shepherd’s Hill, Hampstead Lane, etc, are included. The fact that it’s not enforced isn’t really Haringey’s fault. Perhaps “pointless” was a bit strong but spending a £1m or so on a policy that seems to have little or no effect and will not be enforced is not obviously a really good thing to do. I’d have been much happier with a targeted policy to slow traffic on the 5% (?) of roads where there’s a problem. An interesting article by Simon, but I would caution against increasing local speed limits. Apart from being more noisy, potentially more polluting and dangerous to pedestrians and cyclists, there are some thoughts that lower speeds improve flow, which might reduce journey times and the awful queuing at the bottlenecks around Archway or Highgate. How to best police speeding (particularly outside of peak hours), improve driver behavior or reduce car travel to the local schools for example is another essay. I didn’t mean to give the impression that I was arguing for increasing limits, just that putting up signs for a lower limit doesn’t seem to deliver much impact in the first few years. Lower speeds on the main roads where there are most of the accidents (but sadly not where the limits have been lowered!) would receive my full support (if not everyone’s). I agree that it seems to be queues and stop-start that gives most noise and air pollution. While it’s a laudable objective to reduce speed limits to reduce noise, polution and accidents – the problem is as we agree, that those limits are routinely ignored. My own special irritation is with motorcyclists, who often accelerate violently towards or away from the junctions and lights along Archway Road – often first barging their way past cyclists and over the ASL’s. What a pity more people are not more thoughtful how they park, drive or do both those things whilst staring into a phone or tablet. Idiots! Without permanent enforcement like traffic calming or speed cameras, I think most drivers do routinely ignore speed limits – especially lower ones. I particularly hate the motorcycles accelerating towards or away from the junction near Highgate station – often on the wrong side of the road jumping traffic or violating the ASL’s making it dangerous for cyclists. It is a pity the cycle super highway CS12 that was to run the length of the Archway Road was cancelled. The modifications that would have come with it might have improved this situation and the entire street scene. Otherwise it would have been nice to see the improvements taking place around the Archway gyratory spreading towards Highgate. Who knows – perhaps the traffic flow will anyway be reduced upstream when the work is complete? Given a choice I’d set more cameras on Archway Road, as well as North Hill and Hampstead Lane, but it’s probably not going to happen. Now if only there was also a way to catch the even more selfish idiots who drive staring at their phones and tablets as they pass through Highgate!